If you're a marketing director or anyone in charge of puchasing promotional items for your business, you probably already know that many of these promo companies offer the same old same old. With that being said, a lot of buyers have gotten savvy in their searches or their ideas, and we see the occasional request for a different kind of pen. 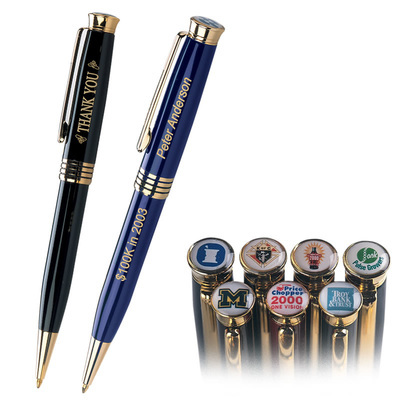 One of these occasional requests is pens with logos on top. 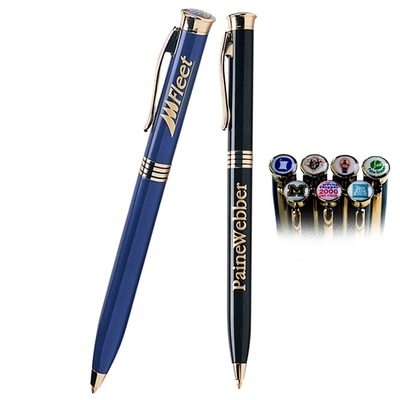 We have, as far as we know, the largest variety of pens with logo on top in the entire business, and they are ALL available with full color logo, some come stadard with a two piece gift box, and they ones that don't can have it added for a small fee. These make FANTASTIC gifts because most people haven't even seen these great writing instruments. If you click any of the pictures below, they will take you to our store where you can check out the price lists and place an order, or as always call 401-451-1874 to have your questions answered by a 20+ year industry professional.